No. 1 is always fooling around with hunks of cloth. Sometimes she sits at a table and runs a contraption that goes whiiiirrrrr. 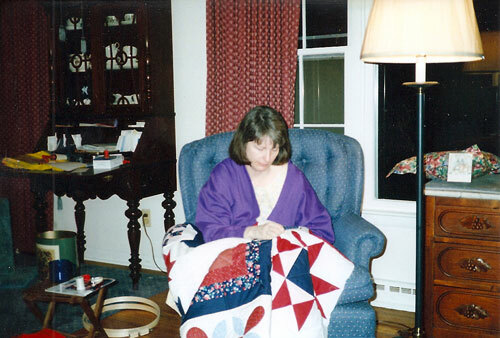 Other times she sits with a big blankie on her lap and does things with it. Sharp implements are involved. At these times I am not allowed to sit on the blankie on her lap. I can lie under the blankie, or I can lie on the part of the blankie that is on the floor (but for some reason she moves it frequently so it’s not all that satisfactory). In my opinion, the hunks of cloth could be left just the way they are. A pile of them makes a good bed, and they would be fun to scrunch up. No. 1 does not agree. So I abide by her wishes and take up my self-appointed duties as the Quilt Puppy. Here’s my job description. • Keep No. 1 company in the studio. • Dog-approve all quilts by lying on them at some stage of completion, testing them for comfiness. • Fetch spools of thread that have rolled under the sofa. My favorite quilting activity is the reading of magazines. I take my duties seriously. In fact, it will come to pass in a few years’ time that No 1 will name her whole company after me. But that’s another story, one that will be told in the fullness of time. The humans have gone off the deep end. Last night they lined me up and subjected me to the following spectacle. This episode was followed by tasty treats, which enabled me to get over the shock. The weather isn’t quite as warm now, and it looks like this in the back yard. Just like dogs, our trees are shedding. They’re turning all their leaves brown and dropping them on the ground. The leaves are crackly and crunchy when you step on them. For some reason, the humans are not content to let the crunchy leaves stay on the ground. No. 2 rakes them up into big piles. Then the Klingons come along and jump into the piles and scatter them around again. This is fun to watch, except that the colors of the Klingons and the colors of the leaves are about the same, so you have to keep a wary eye out in case of sneak attack. When they’ve had their fun, they lay around and don’t even help make the piles again. No. 2 goes away sometimes. I don’t like this. The first clue is when the suitcase comes out. All of us help him pack. The way we do it is, No. 2 puts the suitcase on the bed. The Klingons get into the suitcase. No. 1 calls out “Socks, underwear, shirts, pants!” No. 2 yells “Check!” I watch with a sinking feeling in my stomach. It’s good to have a human and a spare. When it’s warm outside, we go for a walk after dinner. The whole pack goes… me, the humans, and all three of the Klingons. The way we do it is, one of the humans says “Walk!” and we all get ready. Did you say walk? Now? It's time? I get my leash on and we all gather in the side yard. Then we go up the road a little ways and turn left. The Klingons are slow, so we have to wait until they all catch up. Then we go down a hill. We stop and look out across a field to an old house where nobody has lived for a long time. No. 1 says this is her favorite view of all. Then the funnest part. We go into the woods! There’s a little path there and we all walk through. I stay on the path but the Klingons take the high roads. At the end of the path we come out behind a house where there’s never anybody there, and my bestest Klingon goes and rolls and flips in a patch of dust. I really don’t know why she enjoys this but I guess it takes all kinds. Then it’s a race to the finish. No. 2 goes out ahead and calls the race as the Klingons head toward home. I must say that they do not understand the concept of a race, because they go in fits and starts, and they stop to look behind them all the time. One time on the way home I walked through a patch of weeds, and they grabbed me! I was stuck! Couldn’t move forward, couldn’t move backward. The humans rescued me from these grabby plants and carried me home. “What a mess!” I heard. They took a long time to pick a whole bunch of little bitty green sticky things out of my coat. I heard No. 1 exclaim, “213!” That was not that much fun. [No. 1 here... the "house where where there's never anybody there" is a non-residential frat house down the street from us in Gambier, Ohio, a tiny academic town in central Ohio, home to Kenyon College.